Run by the founder of MedFriendly.com, the MedFriendly Medical Blog brings you up to date news, commentary, and perspectives on diverse healthcare topics, particularly those that are interesting or unusual. Click here for ADVERTISING information. Long before the modern day Coca-Cola beverage existed that billions of people drink around the world today, there existed a drink known as coca wine. Coca wine was sold in the 1800s alongside many other beverages at the time that contained cocaine. While this may sound shocking to some people today, back then, cocaine was a commonly used medicinal substance and it was not illegal. For example, see the prior blog entry on the use of cocaine tooth drops. Coca wine contained 30 grains of Erythroxylum coca per ounce of wine. Erythroxylum coca is one of two species of cultivated coca and is used to make cocaine (a stimulant drug). When wine is combined with cocaine, it creates a substance called cocaethylene. When ingested, it is almost as strong as cocaine. Below are pictured two images of a coca wine bottle from Metcalf’s Coca Wine (click to enlarge). 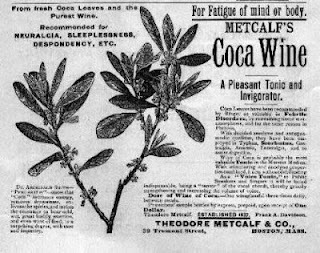 As you can read from the back of the bottle, manufacturers of such drinks marketed them based on medical claims, leading consumer to believe that coca wine could cure just about any sign or symptom (i.e., “…a remedy for every malady…”). It was advertising as treating headaches, anxiety, fatigue, depression, and fever, soothing the vocal cords, aiding digestion, and more. However, these drinks were also used for pure pleasure seeking purposes. It was specifically marketed to children, elderly, and people who were in a stage of healing, as you can see written on the back of the second bottle. Metcalf’s coca wine was not the only one on the market (Vin Mariani was a famous brand in Europe), but it was one of the most popular. The manufacturers claimed that a medium dose of their wine produced a slow and sustained effect different from the excitation caused by any other wines. The dose? Three wineglasses a day! It is because of questionable medical claims such as these and the lack of dose modification for children versus and adults that stricter regulations over pharmaceutical substances later came to pass. It is interesting to note the marketers claiming a benefit of a slow and sustained release because it reminds me of the present day and age when drug companies market slowed release forms of stimulant medications (e.g., Ritalin) to treat children with attention deficit hyperactivity throughout the day. 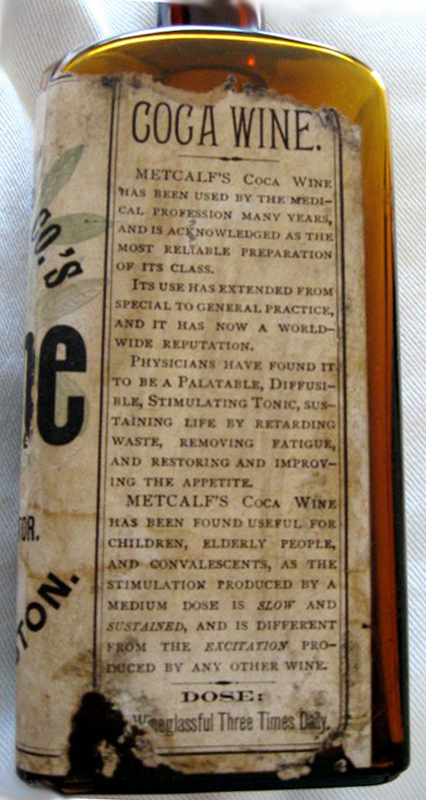 Metcalf’s coca wine was run by Theodore Metcalf (1812-1894), a pharmacist who ran a widely known pharmaceutical business, selling products all over the world. His store was a mecca for famous people such as Charles Dickens and Oliver Wendell Holmes. Millions of prescriptions were filled by the company, written by some of the greatest physicians of the time. When Metcalf retired, he transferred the store to others. Eventually, John Pemberton of Atlanta, created his own version of coca wine, based on the Vin Mariani beverage. He called it Pemberton’s French wine, sold it in a pharmacy, and promoted it as a stimulator of the sexual organs. Once the Prohibition began in 1886, Pemberton replaced the wine in coca wine with sugar syrup and Coca-Cola was born. 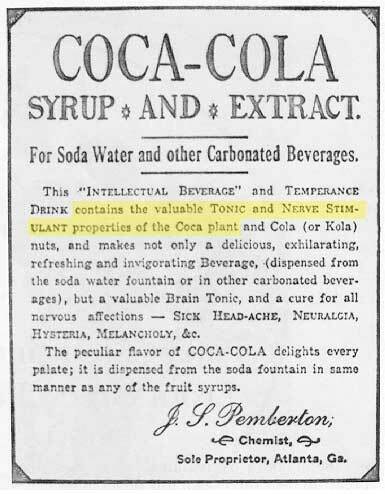 He marketed it as “the temperance drink” and once again, it is seen in the ad below that it was promoted as a cure for all nervous conditions even though this is obviously not true. Coca-Cola initially contained cocaine. 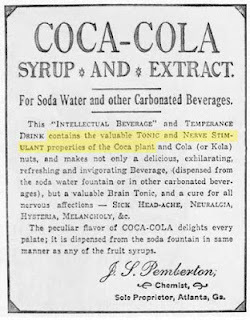 Due to growing concerns about drug addiction in the U.S., cocaine was removed from Coca-Cola in 1904 (except for trace amounts), but the cola leaf remained. Now days, there is no cocaine in Coca-Cola at all. Cola wine no longer exists today in legal form but it led to a drink that almost everyone has tasted. Reference: Mason, B. (1908). The Metcalf Pharmacy in Boston. Bulletin of Pharmacy. I (XXII), 279-82. Is it Bad to Have Undigested Food In Your Poop? Does Your Kids’ Cereal Contain BHT or BHA – An Ingredient in Jet Fuels? Mine Did.